Novi Sad is the capital of the northern Serbian province of Vojvodina and the administrative centre of the South Backa District. The city is located on the border of the Bačka and Syrmia regions, on the banks of the Danube river and Danube-Tisa-Danube Canal, and facing the northern slopes of Fruška Gora mountain. 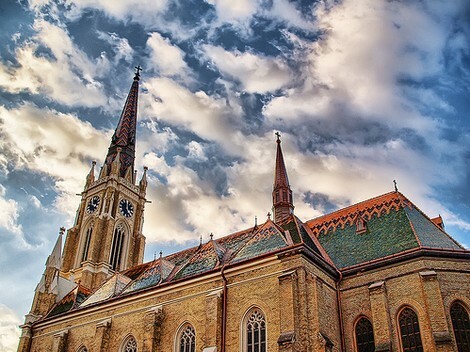 Novi Sad is located 70 km from Belgrade, and connected by an international highway with Budapest, Vienna, Belgrade, Athens, Bucharest and Istanbul. Highway E-75 (Budapest - Belgrade - Nis) goes near the city, and there is highway E-70 (Zagreb - Belgrade) in the vicinity. Novi Sad is the second largest city in the Republic Serbia. The town was established in the 17th century as settlement of artisans and merchants on the left bank of the Danube River. The town gradually grew in importance and established its first secondary schools, the Gimnasium in 1810, the Library Matica Srpska with the oldest literary journal in Europe that appeared in print in 1826 and the Serbian National Theater in 1861. After the First World War, Novi Sad became part of Serbia and Montenegro. Today, Novi Sad is a city with about 350,000 citizens and it is the political, administrative, economic, cultural and educational centre of Vojvodina. The focal point of the city is the Petrovaradin fortress. It is located on the right bank of the river Danube, opposite to the city centre. It was built between 1692 and 1790, according to the plan of the French architect Sebastian Voban. The fortress covers the area of 112 hectares and has 16 km of underground corridors on four levels (some of the corridors are supposed to lead under the river Danube). Today, the fortress provides a home to artist's studios, a museum and a hotel. From the fortress, there is a beautiful view of the city. Different cultural events take place on the Petrovaradin fortress – one of the largest and most popular is the summer musical festival EXIT that gathers around 250,000 to 350,000 young people. The city centre abounds in buildings of different architectural periods, including gothic, baroque, secession and neoclassicism. Today, these historical buildings mainly house various institutions, museums and galleries. Novi Sad is simply one of the historical treasures of Europe. Another such a location is Prague, capital of Czech, where you can live almost directly in the old town - try for example Prague apartments for rent in Albertov.